You’ve obviously liked the vehicle platoon deals we’ve brought you over the last few weeks so here are a few more to tantalise you with! 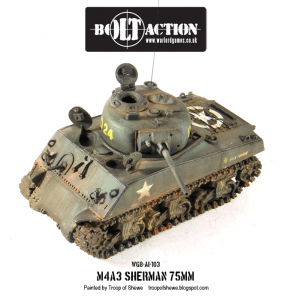 The M4A3 75mm Platoon includes three US Sherman Tanks, saving you £5! The Panzer 35t Platoon includes three Pz35t Tanks. Save £6! The Panzer 38t Platoon includes three Pz 38t Tanks, saving you £6! The Chi-Ha Platoon includes three Japanese Chi-Ha Tanks and saves you £5! The Vickers Mk VIb/VIc Platoon includes three Vickers Light Tanks, saving you £6! The 250/1 Platoon includes three Sd.Kfz 250/1 Halftracks with the option to add a 250/9. Save £6! The 251/1 Platoon includes three Sd.Kfz 251/1 halftracks with options to add a 251 Stummel, 251 pak 36, or 251/8 ambulance. Save £6! The German Light Armoured Car Platoon includes three 221 or 222 armored cars - your choice! Saves you £6! The German Heavy Armoured Car Platoon includes three Sd.Kfz 231 (8-rad) armoured cars and saves you £5! With free shipping on all orders over £50 GBP worldwide you've no reason not to grab these bargains for your armies!